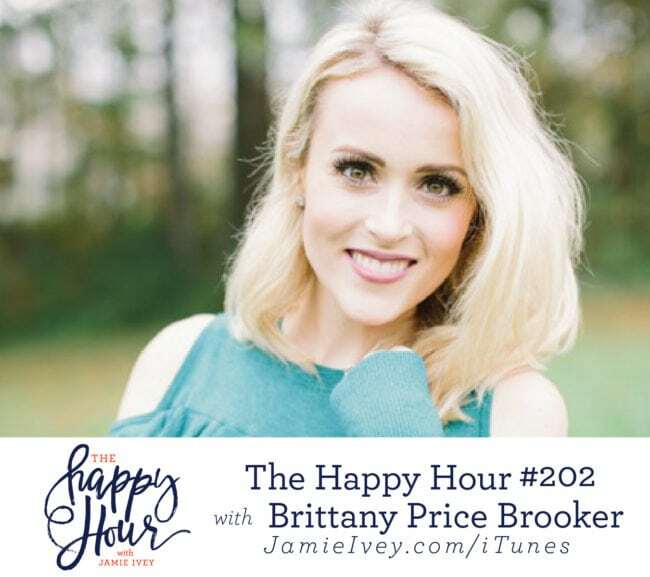 My guest for The Happy Hour # 202 is Brittany Price Brooker. Brittany is mom, widow and remarried, singer, and speaker passionate about making Jesus known! Together with her husband Daniel, they are raising five children and they've come to be known as the Brooker Bunch! Brittany starts out sharing with us how when she was 25, she lost her husband Patrick and was left a widow with three young children under the age of 3. It was unimaginable, but Brittany describes how even starting with the night before Patrick died, she can see how God was preparing the way for her to be able to walk through her worst nightmare. Brittany tells us about the pain of not only losing her husband, but having to see her children grieve. She so honestly shares her cries out to God. You guys - it will give you chills as you hear how God answered prayer after prayer, and people kept showing up. It is such an encouragement to all of us that we can show up for one another -- even what may seem too small or too crazy can actually make a huge impact in someone's life. In the second half of the show, Brittany describes how God brought her to meet her husband Daniel, who is also a widow. After about a hundred emails they finally had their first phone conversation -- which of course lasted 5 hours! Brittany talks about the tender navigation of bringing two grieving families together. She stresses the importance of grace, therapy, community and allowing everyone to process their feelings and know it's okay to feel sorrow and joy at the same time. Brittany has gone through much suffering in her short life, but in her story you can so clearly hear how Jesus continually brings hope and provision, and that we all have opportunities to show up for each other!